Finally. At long last I was able to hook with Lauren, from San Francisco, who is the proud winner of the Cycle Chic / Velorbis Climate Conference Gorgeousness Competition. Christmas and the holidays got in the way of the bike handover so we finally met up a few days ago on the harbour in Copenhagen. 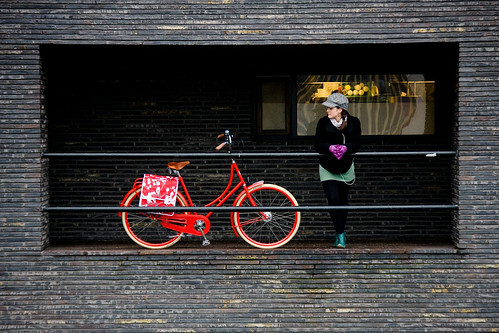 In the photo above, Lauren and her Studine bicycle check each other out, ready to embark on a fruitful relationship. 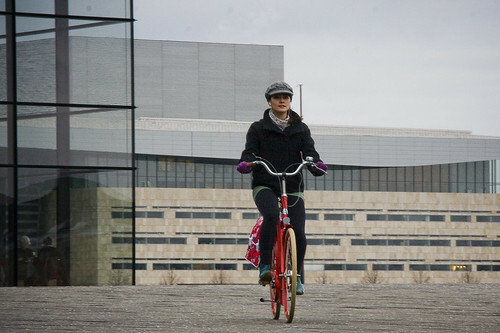 Lauren and I had a lovely chat as we walked about in the icy cold weather and took photographs on the harbour by the new Royal Theatre [Skuespilhuset] with her and new red Studine bicycle from bespoke Danish bikemaker Velorbis, who were kind enough to offer up a bicycle for the competition. I learned that Lauren, whilst growing up in the States, discovered that she loved badminton and was good at it. Must be a lonely life as a badminton player in the States. Kind of like being an American gridiron football player in Denmark. You have to go where the game is played professionally if you wish to make a career out of it. Badminton-wise, you have Asia and you have Denmark or the UK. Lauren ended up here and currently plays in the national leagues for Herlev Badminton Club. So she's figuring out life in Denmark and writes about it on her blog The Dansk Badminton Life. We had a brilliant time despite the cold. 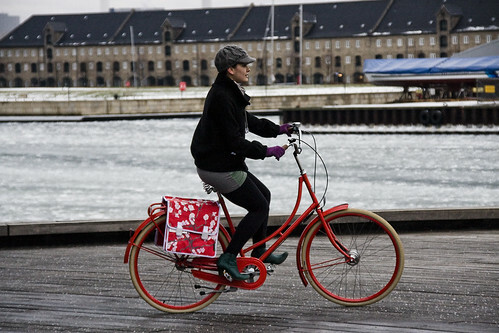 Lauren's outfit certainly signals her deep and complete understanding of Cycle Chic and the red Studine bicycle from Velorbis certainly looked extra good against the grey skies and white ice on the harbour. We agreed that the pannier bags were a bit out of place here in Denmark and that a basket was a necessity here in Copenhagen, but I could certainly tell that Lauren was thrilled about the new bicycle. Check out Lauren's prize winning entry here. Hot! Do you get shapely legs because you cycle, or do you cycle because you have got shapely legs? Nice pictures. Great pictures and interesting back-story. She and the Velorbis go together very well. I love riding in all types of weather I just with more people would consider using their bicycles to commute. great saddle bags by the way. cycling isn't exercise. it's the way we get to work, the shops, the cinema, etc. Nice blog! It's cool that it spreads the joy of cycling, because I think it's the best sport/moving we can do. What a deserving winner. Your top portrait rocks, as do her boots and gloves. Best wishes, Lauren! Wow, I wished I looked that good on a bicycle. She's so gorgeous while driving a bicycle. Took me back to my boyhood when all I owned was a bicycle. Never rode in winter though. Thanks for the memories. Beautiful! Love the close up of her green shoe on the pedal. Would love to see photos of her cycling around San Francisco. congrats! for being "Blog of Note"
Absolutely stunning. Like hot sauce for the what the eyes see. I love the Basil saddlebag and have been craving the same one for over a year. That first pictures is awesome (the one where they're checking each other out)! Beautiful colors, contrast, and framing.